Let’s get ready to ROW! 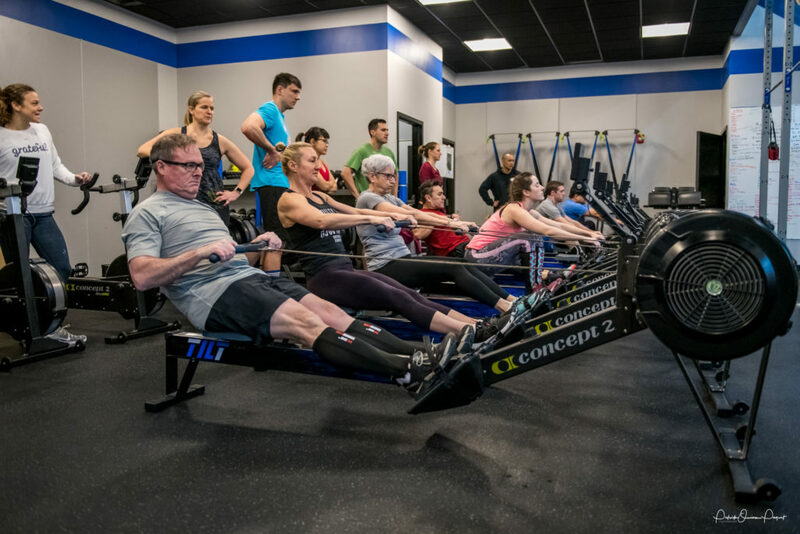 The class workout on Saturday is a 10k row! That’s right! Even if you’re not signed up for the Rowathon you can still row a 10k! Win win! Continue to add 3 repetitions per round until the 7 Minute Cap. Quick sets on the barbell today. Manageable sets on the toes to bar. Check out Kathleen’s new post about the importance of protein HERE. Almost time for the Rowathon! It’s all happening this Saturday 2/9 starting at 6pm! How to sign-up? Show up 10 minutes before class to sign-up! Or.. sign-up online HERE. 104 @55# and mid for t2b was holding Med ball (14#) and lifting knees to it right knee touch ball, left knee rich ball – counted as one). This was an easy mod but need to strengthen my core without injury so it was perfect. So 1 or 3???? !!!!!! This is like the equivalent of me at a restaurant…I can’t pick one dish so I make someone split two things with me so I can have both the short ribs and the scallops….you get me? I am with Max, Ken made #3 GOLD. 13.4: 98 (95#) Knee ups. I have never seen Toy Story 1,2, or 3 in their entirety. I apologize in advance for whom i have offended by revealing this. Wow, first you defend Maroon 5 and then this? I just don’t get it. How could you have not seen any of these movies?!?! This blows my mind. Honestly I don’t care about the Maroon 5 thing. I care about Toy Story. She blamed the whole thing on her sister this morning. I CONFIDED IN YOU. KELLY IS NOTHING SACRED. Dude what is wrong w you. What do you actually watch? Also have you always been so serious? I feel like you were born a grownup. Max: next QOD: 3 movies you have to watch when they are on. truth be told, not all my TTB had my feet touching the bar, was trying to string them together (as per Casey’s rec) by kipping and my flexors were fatiguing. But I made it through best I could. Each one just keeps getting better. I loved the first one. I was in high school when the second one came out and I saw it in the theatre. I was so blown away by it that when it came out on video I bought my family our first DVD player. TS2 has been in my top 5 favorite movies ever since. When TS3 came out and I wasn’t expecting it to be able to match the level of TS2 but OMG was I wrong. I loved the plot twists in TS2, but it didn’t really affect me emotionally. When I saw TS3 it broke me. I did some serious crying, not just little sappy tears, full out “someone hold me” mode. TS3 touched me deep. Now TS2 and TS3 are both in my top 5. I am very optimistic about TS4 but trying to keep my excitement in check. If all goes well I’ll need a therapy appointment as soon as I walk out of the theatre. HAHAHA. Therapy is a must. Ed let’s go see TS4 together. I want to be there for you. Haha, I’d love that. I’ll need your support. Mark your calendar June 21st. 82 @65# – Knee Flicks – Z was the best coach ever!!! QOD: I’ve only actually seen the original, I haven’t kept up and am clearly missing out. QOD – TS3 all the way. Mostly for the scenes in Kens Dream House. Thanks Brad! PRs on this workout are few and far between because I do it the same way every time lol. Singles on the cleans and try to hold onto the T2B. First workout back, my partner told me I shouldn’t pace myself. QOD- I’ve only seen 1 & 2. 1 is better. Toy Story 1. It set the standard. Only seen Toy Story 1 and 2, with 1 being superior. The entire time I watched TS3 I had one of those lumps in my throat from being on the verge of tears for 80 minutes; the water works came HARD at the end. QOD – Toy Story 1! This is a tough one. 1 is a classic, 2 has its moments, and 3 made me cry. I’d say 1 as the best though. 66 reps, 95#, knee raises. Should have pushed harder throughout the round of 9 then just hung on for dear life.